Egg whites are a high-quality protein source, but whole eggs often get a bad rap. It's time to crack a few myths and showcase the power of the yolk. Egg whites are often referred to as the perfect protein, due to their amino-acid makeup and the body's ability to utilize them properly. 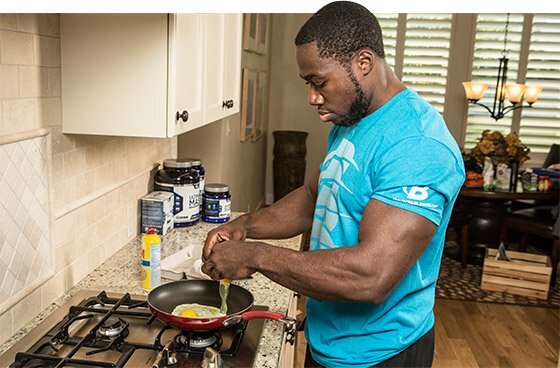 Although bodybuilders used to focus on just the egg white for protein, and avoided the yolk because of the fat and cholesterol—it's now known that it's more beneficial to consume both the egg white and the yolk together. That's because that golden center contains the majority of the micronutrients in eggs, including vitamin A, vitamin D, vitamin K, B vitamins, selenium, iron, zinc, and phosphorus. "That golden center contains the majority of the micronutrients in eggs, including vitamin A, vitamin D, vitamin K, B vitamins, selenium, iron, zinc, and phosphorus." The yolk also contains all of the egg's fat and cholesterol, but don't let that scare you off. Blood cholesterol levels don't seem to be negatively affected by whole eggs. In fact, one study from the University of Connecticut tested the cholesterol response of 25 males and 27 females to an egg diet (640 mg per day of additional cholesterol) and a non-egg diet (no additional cholesterol). 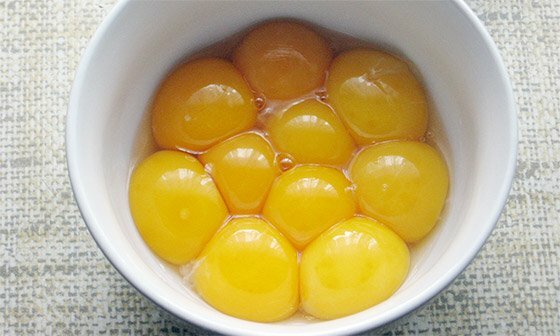 They found the cholesterol in egg yolks does not raise the LDL cholesterol particles that are particularly associated with the development of cardiovascular disease. Cholesterol also helps maintain the integrity of muscle cell membranes, which helps them function properly and avoid breakdown. Scientists from Kent State University put 47 older adults (ages 60-69) on a 12-week weight-lifting program, and tested them before and after for changes in muscle mass and strength. They placed all subjects on a moderate protein diet, and divided them into two groups. One group followed a lower-cholesterol diet (1.6 mg per pound of body weight or approximately 150-250 mg per day), while the other half consumed a higher cholesterol diet (2.6 mg per pound of body weight or about 250-450 mg per day). After 12 weeks the group that consumed the lower-cholesterol diet did not increase muscle mass, and only increased their strength by about 35 percent. The higher-cholesterol group, on the other hand, had an increase in muscle mass of about 5 pounds, and upped their strength by about 90 percent. Eggs can also help you get leaner. Research from Saint Louis University found that people who ate eggs for breakfast consumed fewer calories throughout the day than those who had a breakfast with the same amount of calories from a carb-heavy bagel. A follow-up study by the same team found that when women consumed two eggs for breakfast at least five times per week over a 12-week period, they lost 65 percent more weight and had a 34-percent larger reduction in waist size compared to those who skipped the eggs. The study also found that adding two whole eggs to breakfast resulted in no changes in cholesterol levels. "Research from Saint Louis University found that people who ate eggs for breakfast consumed fewer calories throughout the day than those who had a breakfast with the same amount of calories from a carb-heavy bagel." While eggs are typically thought of as a breakfast food, you can enjoy them anytime throughout the day. Hardboiled eggs work great in salads or as a stand-alone snack. 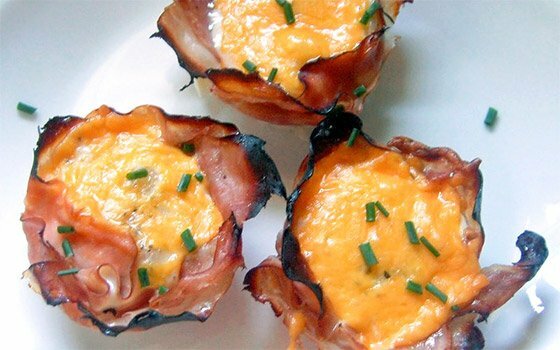 If you really want to kick your eggs up a notch, try my Egg and Ham Cups; they're delicious and easy to make. Yamamoto, T., et al (eds.) Hen Eggs: Their Basic and Applied Science. CRC Press, Boca Raton, FL. 1997. Herron, K. L. High intake of cholesterol results in less atherogenic low-density lipoprotein particles in men and women independent of response classification. Metabolism, 53(6): 823-830, 2004. Layman, D.K., et al. 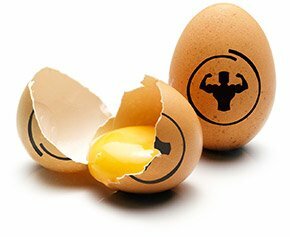 Egg Protein as a Source of Power, Strength, and Energy. Nutrition Today, 44(1) 2009, 43-48.